Reggie loves his maple syrup. He also knows that if he wants to have a continuous supply, he better keep the Canadians happy! That's where Smash Club comes in. 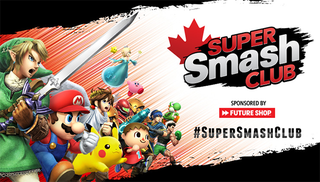 A social event for Smash fans to gather, play for fun, play for glory, even play for some swag. The event was ticket-based, and to grab a free ticket it was first-come, first-serve. The moment it was announced I made sure to grab enough tickets for my brothers, a friend, and myself. Finally, Saturday October 18th. Game day was upon us. I must say, they picked a very interesting spot for the Toronto event. At first glance, I was slightly concerned about my safety. We found parking and walked through the above alley to get to where we needed to be. Once we found the place (not hard to miss due to the massive line of rabid Smash fans), we knew it'd be all right. It turns out Nintendo was using some buildings that are used as film studios. We waited outside for about 30 minutes before the line slowly shuffled in. Everyone was playing Smash waiting in line, and it was easy to join a match with some strangers and have some fun. As the Nintendo reps came by to scan your ticket, you were given a wristband to gain access. Also on the wristband was your heat number. Once inside, they would call your number and you would go up and have a chance to fight for some Smash swag (when I fought they were handing out bags with the Smash logo on it, not sure if there was anything else). Everyone was given a Smash Bros. dog tag upon entering. Eventually we were herded into a large white room. They had the rules up on the wall, a projected game of Super Smash Bros. for 3DS for all to see, and a collection of "battle stations" for the swag games, as seen below. Overall, it was a fun outing.